Do you need a Military Leave Letter? Download this professional Military Leave Letter template now! 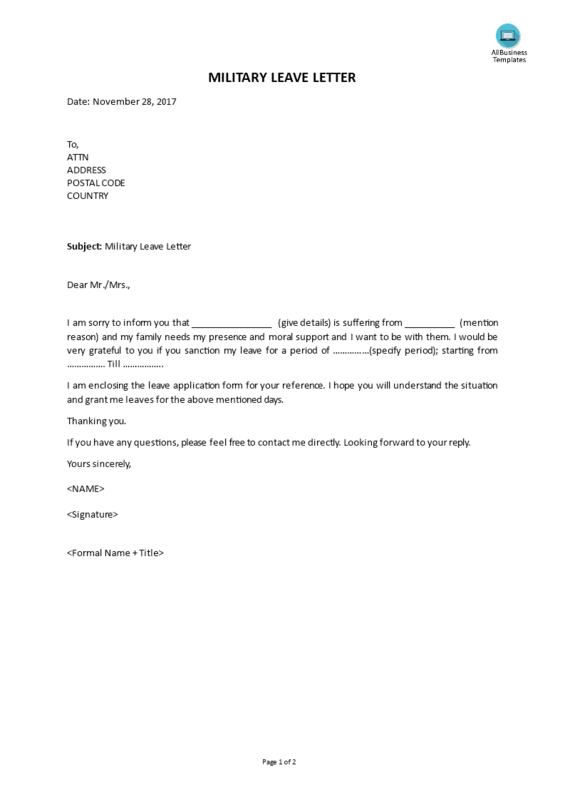 This ready-made and easy-to-customize a blank Military Leave letter template is well suited for any kind of personalized business matter. Communicating in a professional way will get you respect and will bring you further in life and business. Using this Military Leave Letter provides you with a perfect example letter template that you can finish within minutes, so you will have more time to focus on other, more important things. An (Annual) Military leave or vacation is earned by eligible soldiers from the first day they start their duty. The government allows their employees to receive credit for their earned leave on a (semi-)monthly basis, and the amount of leave days accrued is based on years of service. Firstly, check the policy and what form you need to apply for your vacation leave, and how much time in advance you need to submit it. It can help to get approval for your request, f you before you start to write the leave for vacation letter, check with your fellow soldiers who will be affected by your absence, for their plans and see if they can help you taking care of your tasks for the time you are not available. Make sure that you also notify those who may be inconvenienced, like partners or customers. Confirm if HR and your commander received (and read) it. We support you by providing this Military Leave Letter template, which will save you time, cost and efforts and help you to reach the next level of success in your career and business! Download this Military Leave Letter template now and enhance your life!